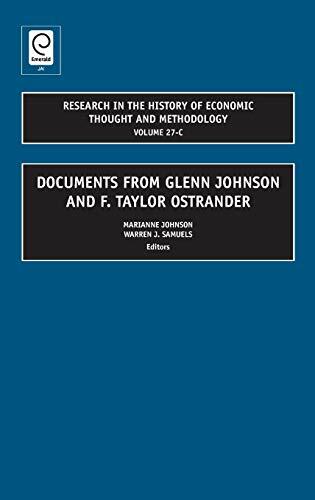 Volume 27C of "Research in the History of Economic Thought and Methodology" consists of documents from Glenn Johnson and F. Taylor Ostrander. Part I includes: notes from lectures by James E. Meade on the linking of monetary theory with the pure theory of value (Oxford University, 1932-1933); notes from the Socialist Club at the Cafe Verique in Geneva (Summer 1931); correspondence between Frank H. Knight and F. Taylor Ostrander; index to the Treasury Department papers of F. Taylor Ostrander; and notes on the long and wide-ranging career of F. Taylor Ostrander. Part II presents Glenn Johnson's notes from courses at the University of Chicago (1946); notes from Lloyd Mints' course on money and banking, economics 330 (Fall 1946); incomplete course notes from Milton Friedman's price theory, economics 300B, University of Chicago (Spring 1947); and notes from seminars by John R. Hicks and Tjalling Koopmans, University of Chicago (October 1946).